Fast paced shmup action in a cartoony world full of cute but deadly little bugs. Venture four unique environments with diverse and challenging levels. Spit through a huge variety of enemies and savage boss creatures. Easy accessible for all gamers. Easy to pick up and play, but hard as hell. Unlockable Battle Bugs game mode, including 3 challenges with 5 characters to choose from to blast your way to the highest score. Fully Remastered 19 Track Soundtrack. 6 Exclusive Wallpapers in 1920x1080. All the music from the game has been fully remastered. Every tune from every level has been lengthened into full a track and polished from the ground up. 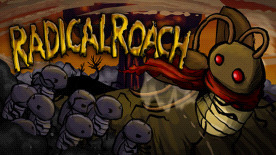 RADical ROACH © 2014. All Rights Reserved.